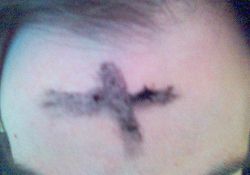 During Ash Wednesday, it is traditional for many Christians to place a cross made of ash on their forehead during Mass. In many Christian churches, Ash Wednesday is a day of repentance and the beginning of Lent. Ash Wednesday occurs 46 days before Easter and falls on different dates each year in conjunction with the fluctuating date of Easter. Among Roman Catholics, Ash Wednesday is observed by fasting, abstinence from meat, and repentance—a day of contemplating one's transgressions. In the Anglican church, the Book of Common Prayer also designates Ash Wednesday as a day of abstinence from particular foods. Ash Wednesday is not observed in Eastern Christianity, and in other Christian denominations, including Lutheran churches, Methodist churches and Reformed churches, these practices are optional, with the main focus being on repentance. Fasting is seen by many religions as an effective means of drawing closer to God; denying the normal bodily focus on food allows the mind to give attention to higher things. Ash Wednesday symbolizes a time for repentance. Repentance is an effective spiritual practice for humbling the self and the tendency towards self-centered desires. This places the penitent in a position to be an object partner to God, the Subject. Repentance is most effective when it expresses genuine remorse for sin, accompanied by a strong determination not to sin again. Ashes were used in ancient times to express penitence. Dusting oneself with ashes was the penitent's way of expressing sorrow for his or her sins and faults. An ancient example of this rite of penitence is found in Job 42:3-6 where Job says to God: "I have heard of thee by the hearing of the ear: but now mine eye seeth thee. Wherefore I abhor myself, and repent in dust and ashes." Other examples are found in several other books of the Bible including, Numbers 19: 9, 17, Hebrews 9:13, Jonah 3:6, Matthew 11:21, and Luke 10:13. Fasting for a set period of time (in this case, 1 day), or abstinence from particular foods (compare the lifestyle of observant Jews who keep kosher) is an effective means of drawing closer to God and separating from worldly concerns. It pushes down the normal bodily urge for food in order to allow the mind to focus on higher things. Not all Christians celebrate Ash Wednesday, and some suggest that the practice is of pagan origin and is inconsistent with Scripture. They usually cite Matthew 6:16–18, where Jesus gave prescriptions for fasting: "And whenever you fast, do not look dismal, like the hypocrites, for they disfigure their faces so as to show others that they are fasting. Truly I tell you, they have received their reward. But when you fast, put oil on your head and wash your face, so that your fasting may be seen not by others but by your Father who is in secret; and your Father who sees in secret will reward you." (NRSV) These groups argue that Jesus warned against fasting to gain favor from other people and that he also warned his followers that they should fast in private, not letting others know they were fasting. For these reasons, some Christian denominations do not endorse the practice. Others, however, point out that this very passage from Matthew is the one, not coincidentally, that is appointed by the Revised Common Lectionary to be read on Ash Wednesday. On Ash Wednesday, ashes are imposed on the foreheads of the faithful during Mass. The priest, minister, or in some cases officiating layperson marks the forehead of each participant with black ashes, in the shape of a cross, which the worshiper traditionally retains until washing it off after sundown. The ashes signify repentance before God. The ashes may be prepared by burning palm leaves from the previous year's Palm Sunday celebrations. They are blessed according to various rites proper to each liturgical tradition, sometimes involving the use of Holy Water. In some churches they are mixed with light amounts of water or olive oilRetrieved December 18, 2007.  which serve as a fixative. 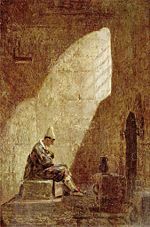 In some of the more free-church liturgical traditions, other practices are sometimes added or substituted, as other ways of symbolizing the confession and penitence of the day. For example, in one common variation, a small card or piece of paper is distributed to the congregation on which a person is invited to write a sin she/he wishes to confess. These small cards are brought forth to the altar table where they are burned. On Ash Wednesday and Good Friday, Roman Catholics between the ages of 18 and 59 are permitted to consume only one full meal, which may be supplemented by two smaller meals, which together should not equal the full meal. Some Roman Catholics will go beyond the minimum obligations demanded by the Church and undertake a complete fast or a bread and water fast. Ash Wednesday and Good Friday are also days of abstinence from meat (for those Catholics age 14 and over), as are all Fridays in Lent. Some Roman Catholics continue fasting during the whole of Lent, as was the Church's traditional requirement, concluding only after the celebration of the Easter Vigil. ↑ Bible Info: Ash Wednesday: Is it in the Bible? Retrieved December 18, 2007. ↑ Upper Room: MethodX - Lent 101 Retrieved December 18, 2007. ↑ Real Live Preacher: Ash Wednesday Retrieved December 18, 2007. ↑ The Diocese of London: Lent and Easter Retrieved December 18, 2007. ↑ Psalm 51 is the Ash Wednesday reading in both the Revised Common Lectionary and The Roman Catholic Lectionary. ↑ The United Methodist Church: What is the significance of ashes being placed on the forehead on Ash Wednesday? Retrieved December 18, 2007. ↑ Catholics United for the Faith: Responses to frequently asked questions regarding Lenten practices. Retrieved December 18, 2007. ↑ EWTN: Communion of Non-Catholics or Intercommunion Retrieved December 18, 2007. ↑ 1983 Code of Canon Law, canon 844 Retrieved December 18, 2007. ↑ First United Methodist Church: Pastor's Message - Ash Wednesday, An Invitation To Lent. Retrieved December 18, 2007. ↑ Beliefnet: A Seating Chart for the Lord's Table.beliefnet. Retrieved December 18, 2007. All links retrieved April 19, 2016. This page was last modified on 7 October 2016, at 15:02.